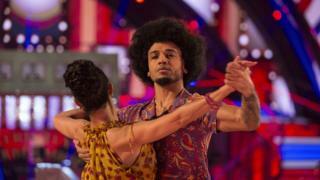 Strictly fans are calling it the biggest shock in the show's history following the exit of Aston Merrygold on Sunday's show.Aston landed a score of four from judge Craig Revel Horwood and found himself second bottom on the leaderboard with partner Janette Manrara.After the public vote, the pair ended up in the dance-off alongside Mollie King and partner AJ Pritchard.Head judge Shirley Ballas chose to save Mollie and AJ.Aston and Janette performed a Viennese waltz, while Mollie and AJ danced the foxtrot. Shirley also came in for criticism, with some saying: "I reckon #ShirleyBallas may be finishing off the show for good! We need #Len AGAIN!" although others defended her, with one fan describing the head judge as "a class act." Some pointed out that people couldn't moan if they hadn't bothered to vote.One fan questioned the "lousy choreography" of Aston and Janette's dance and the decision to do a "Viennese waltz in a Michael Jackson costume".But others laid the blame firmly at Aston's door.Strictly champion Harry Judd wrote that while a score of four from Craig was too low, Aston didn't do himself any favours. Gabby Logan empathised with Aston - she caused a stir when she was sent home from the show back in 2007 after a dance-off with Penny Lancaster. Aston himself has been upbeat about his exit, saying "life is great, I'm gutted obviously but... I'm not sad that it's over, I'm happy that it got to happen! "And the BBC's Betty Redondo, having talked to every other contestant who's gone out of the show so far, told BBC Radio Merseyside that she couldn't get near Aston after Sunday night's results show for an interview. "There was a palpable shock among all the other contestants," she said.The official BBC Strictly Twitter account even posted: "Gone too soon", and ran clips of the other celebrity contestants, seemingly bewildered by the decision. "I was crying my eyes out... I can't believe they're gone," said fellow contestant Debbie McGee. Alexandra Burke's dance partner Gorka Marquez admitted he was "heart-broken" to see the pair leave.